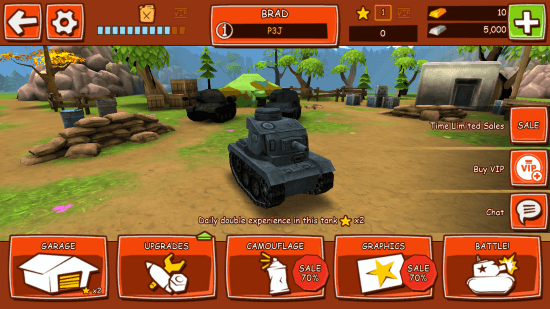 Toon Wars is a free Shooting Game for Windows 8 and 8.1 computers. This is another good release from Extreme Developers. 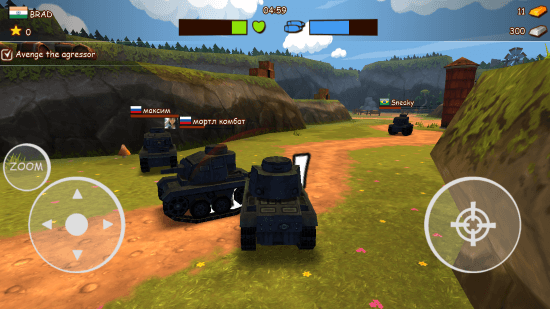 You are in a real time tank battle between you and your enemies. You get to play this shooting game for Windows 8 in a cartoonish environment. 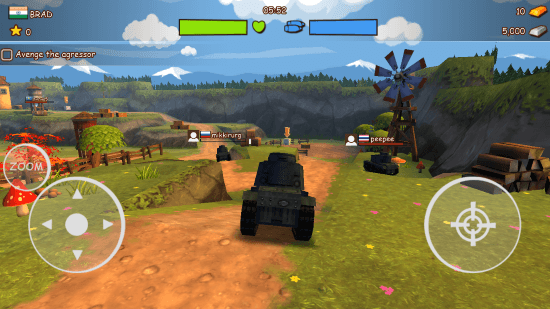 Drive around your Tank, shoot down as many enemy tanks as you can, and survive till you destroy your enemies. This is an online multiplayer game, where participants from all across the world join in. Earn points and upgrade your tank, to be a winner. This shooting game for Windows 8 can be installed directly from Windows App Store. Click on the Download Link at the end of this article to navigate to the game page. This shooting game for Windows 8 occupies just 71.2 MB of space on your computer. Click on Install on the game page to automatically download and install this game. This game is really addictive and easy to play. 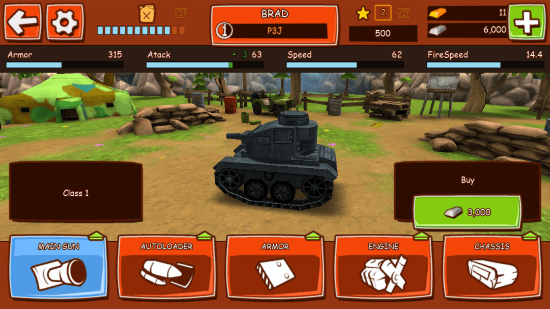 Use the Navigation keys, or the WASD keys to move around the Tank, and use Space Bar to shoot. If you are using a Tablet, then Touch options are available as well. The game welcome screen has options like: Garage, Upgrades, Camouflage, Graphics, etc. The Garage option lets you change your Tank, and buy another tank. Use the Upgrades tab to upgrade your Tank’s Gun power, autoloader, Body armor, engine and chassis strength. Go to the Camouflage, and Graphics options to make your Tank visually appealing. Hit Battle on the main menu to begin the game. The battle field is full of enemy tanks. Shoot them down to achieve the highest rank. the blue bar on the top displays the Autoloader status, and the Green bar displays the life status. Roam around the battlefield, target your enemies, and shoot them down. 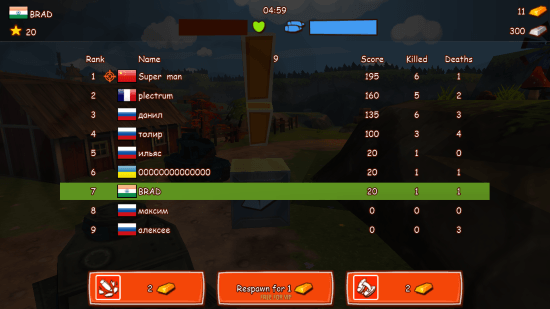 When you loose your life, a ranking list is displayed which shows the number of points, kills, and deaths, along with the ranking in the battle. 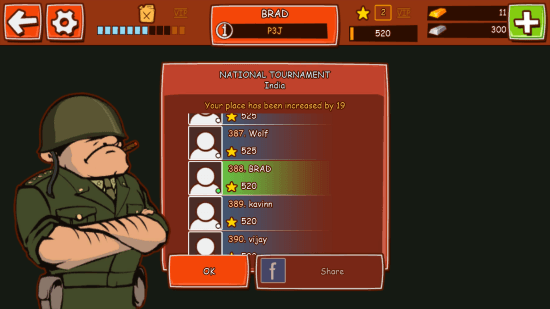 A location wise ranking is also displayed once a battle ends. You also have to take care of the fuel. If you run out of fuel, you lose a life, so be extremely careful in this shooting game for Windows 8. This is a one of its kind shooting game for Windows 8. This multiplayer experience for Windows 8 keeps you stuck to this game. The video effect is pretty simple yet attractive. So do not forget to download this shooting game for Windows 8 and 8.1 computers: Toon Wars.